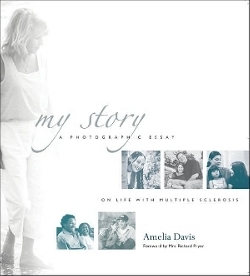 "My Story" - "A Photographic Essay on Life with Multiple Sclerosis", is a book by Amelia Davis. Amelia Davis is a photographer who has taken pictures of people who live with MS for her book. You see some of them in their wheelchairs. Others are walking or running. All of them doing the things they do in their everyday lives while living with multiple sclerosis. Included in the book are 32 essays written by MSers, including Richard Pryor, the comedian. In fact the forward is by Richard Pryor's wife, Jennifer Lee. Here is a little excerpt from it. "People often think that a diagnosis of multiple sclerosis is the end of their ability to live a normal life. By watching my husband Richard, I know this isn't true. MS is simply the next chapter. Together we have found there is always something new to discover, even if it's just the dawn of a new day. In a society where the disabled are often forgotten and left behind, it is important to remember that physical disability is just that -- a physical condition. Beyond the body, there is the mind, hungry for knowledge and wisdom. And beyond the mind there is the need for love. Richard has shown me that the obstacles of physical limitation are challenges that we must circumvent and not surrender to. Despite it all, we continue to build our lives and have learned that joy lies in the simple things." Most of the stories have an essay by the person with MS, as well as a caregiver or another family member. I have always enjoyed reading the stories of others who have learned to cope with MS. And this book has several. You will get a birds eye view into the lives of people from all walks of life. Each with the common thread of MS running through their lives. I'm sure that you will enjoy reading their stories and that you will find many who you can relate to. All information shared on this web site, is informational and for your enjoyment only. It is NOT meant to diagnose or treat any medical condition. Only your health care professional is qualified to diagnose or treat medical conditions. Do not risk your health! If you feel that you may have multiple sclerosis or some other condition, the best thing to do is consult your Doctor. The things we talk about are things that have worked for us. If you decide to follow any of our suggestions, you do so at your OWN RISK.